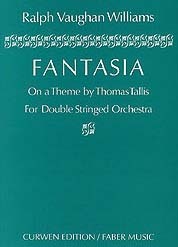 Fantasia on a Theme by Thomas Tallis, also known as the Tallis Fantasia, is a work for string orchestra by the British composer Ralph Vaughan Williams. It was composed in 1910 and performed for the first time on 10 September that year at Gloucester Cathedral for the Three Choirs Festival. Vaughan Williams himself conducted and the composition proved to be a major success. He revised the work twice, in 1913 and 1919. Performances generally run between 14 and 16 minutes. The work takes its name from the original composer of the melody, Thomas Tallis (c. 1505 – 1585). Many of Vaughan Williams' works are associated with or inspired by the music of the English Renaissance. In 1906 Vaughan Williams included Tallis's Third Mode Melody in the English Hymnal, which he was then editing, as the melody for Joseph Addison's hymn When Rising from the Bed of Death. The tune is in Double Common Meter (D.C.M. or C.M.D.). The work is scored for an expanded string orchestra divided into three parts: orchestra I, a full-sized string orchestra; orchestra II, a single desk from each section (ideally placed apart from Orchestra I); and a string quartet. Vaughan Williams made this configuration resemble an organ in sound, with the quartet representing the swell division, orchestra II the choir division, and orchestra I the great division. The score specifies that the second orchestra should be placed apart from the first. This spacing emphasizes, on several occasions, the way that the second orchestra echoes the first orchestra. In structure this piece resembles the Elizabethan-age "fantasy." The theme is heard in its entirety three times during the course of the work, but the music grows from the theme's constituent motives or fragments, with variations upon them. A secondary melody, based on the original, is first heard on the solo viola about a third of the way into the Fantasia, and this theme forms the climax of the work about five minutes before the end. Vayne thinges to bring about? Against his Christ they go. Listeners of the UK classical music radio station Classic FM have regularly voted the piece into the top five of the the station's "Hall of Fame", an annual poll of the most popular classical music works. ^ Alain Frogley: Liner Notes, UPC 094638215721. 2007. ^ a b Mellers, Wifrid (1989). "The Double Man". Vaughan Williams and the Vision of Albion. Barrie & Jenkins. pp. 49–50. ISBN 0-7126-2117-2. ^ Percy Dearmer and Ralph Vaughan Williams, ed. (1906). "Hymn 92 – When Rising from the Bed of Death". The English Hymnal. Oxford University Press. p. 63. |access-date= requires |url= (help) Horatius Bonar's hymn I heard the Voice of Jesus Say and many other D.C.M. hymns may also be sung to this tune. ^ Parker, Matthew (1567). The whole Psalter translated into English metre: which contayneth an hundred and fifty Psalmes. London: John Daye. ^ "Hall of Fame | Classic FM". halloffame.classicfm.com. Retrieved 14 March 2016. ^ Weir, Peter (Director) (14 November 2003). Master and Commander: The Far Side of the World (Motion picture). United States: 20th Century Fox. "Complete performance in Gloucester Cathedral, with page-turning full score". YouTube. Retrieved 14 March 2016.